An industry life cycle depicts the various stages where businesses operate, progress, prospect and slump within an industry. 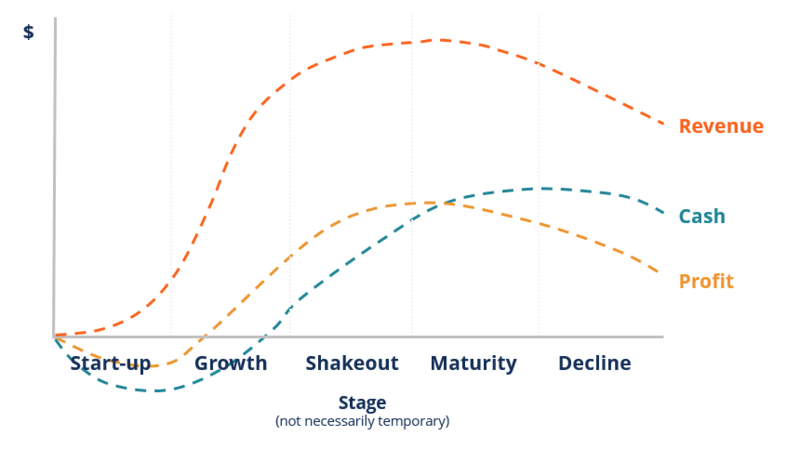 An industry life cycle typically consists of five stages — startup, growth, shakeout, maturity and decline. These stages can last for different amounts of time, some can be months or years. At the startup stage, customer demand is limited due to unfamiliarity with the new product’s features and performance. Distribution channels are still underdeveloped, so there are very few product supply and promotional activities. There are also lack of complementary products which add value to the customers, limiting the profitability of the new product. Companies at the startup stage are likely to generate zero or very low revenue and experience negative cash flows and profits due to large amount of capital initially invested in technology, equipment and other fixed costs. As the product slowly attracts attention from a bigger market segment, the industry moves on to the growth stage where profitability starts to rise. Improvement in product features leads to easiness to use, thus increasing value to customers. Complementary products also start to become available in the market so people have greater benefits purchasing the product and its complements. As demand increases, product price goes down which further increase customer demand. At the growth stage, revenue continues to rise and companies start generating positive cash flows and profits as product revenue and costs break-even. Shakeout usually refers to the consolidation of an industry. Some businesses are naturally eliminated because they are unable to grow along with the industry or are still generating negative cash flows. Some companies merged with competitors or are acquired by those which were able to obtain bigger market shares at the growth stage. At the shakeout stage, growth of revenue, cash flows and profit start slowing down as industry approaches maturity. At the maturity stage, majority of the companies in the industry are well-established and the industry reaches it saturation point. These companies collectively attempt to moderate the intensity of industry competition to protect themselves and maintain profitability by adopting strategies to deter entry of new competitors into the industry. They also develop strategies to become a dominant player and reduce rivalry. At this stage, companies realize maximum revenue, profits and cash flows because customer demand is fairly high and consistent. Products become more common and popular among the general public, and the prices are fairly reasonable compared to new products. Decline stage is the last stage of an industry life cycle. The intensity of competition in a declining industry depends on several factors: sped of decline, height of exit barriers and level of fixed costs. To deal with decline, some companies might choose to focus on their most profitable product lines or services in order to maximize profits and stay in the industry. Some larger companies will attempt to acquire smaller or failing competitors to become the dominant player. For those who are facing huge losses and do not believe there are opportunities to survive, divestment will be their optimal choice. Thank you for visiting our resource on industry life cycle. To learn more about external analysis and how to perform strategic analysis, enroll in our Corporate & Business Strategy course today! Learn to perform Strategic Analysis in CFI’s online Business Strategy Course! The comprehensive course covers all the most important topics in corporate strategy!